November, 2009: A new version of the Beeper was included on the COMBO PICaSTAR panels. This one has the auto off feature built in. The schematics are here. The gremlins got in though, Cap. 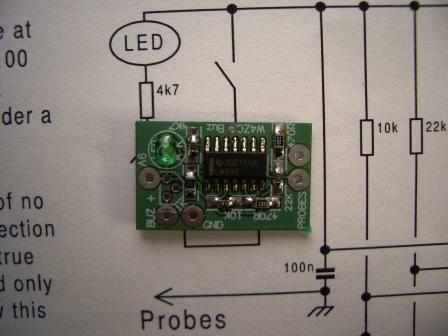 and Diode inserted as below is correct. This PCB is only part built. I used a 1uF Cap. and timeout is about 30 minutes. Old version below without auto off. CAUTION:- there is no reverse polarity protection in this design. Reversing the battery may cause destruction of the IC. This is VK3PE Beeper. Going overboard I guess, but I had the jiffy box and multimeter leads in the "junk box" and this is the result. 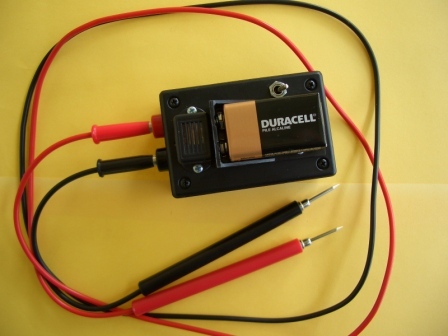 I put the battery on the outside so it is more easily accesible and not forgotten. The probes were sharpened to a point on a grinder. November, 2009: Auto off has been added to the PCB that is included in the Combo PICaSTAR panels.